it is time for a very short review. 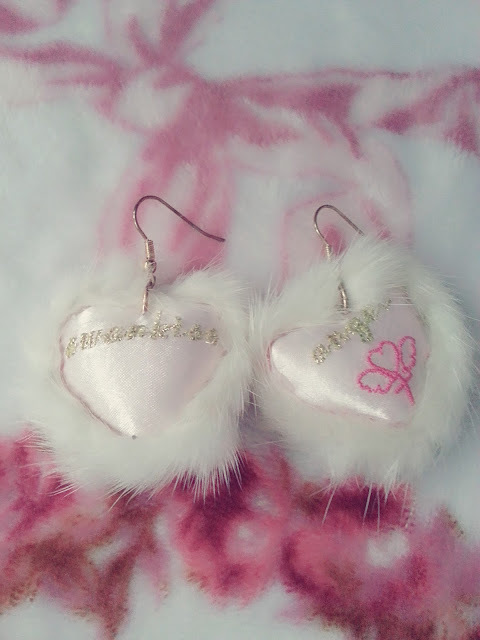 I got these adorable Swankiss earrings in my lucky pack/fukubukuro in December but never wore them until today. I think they are super cute. They have a pink satin lining and the white fur around it is very fluffy and I suspect it is real fur? I am not really sure though. One earring says Swankiss in silver letters and the other one angel with a pink hear on a cross with wings. They are blank on the other side. The material of the hook is very cheap and after 6h of wearing the earrings, my ears started to itch very bad, even though I don't usually suffer from any nickel or allergies like that. After coming home I took them off but now, after 6 hours of not wearing them anymore, they still itch. I can't really recommend them but I will try to use the nail polish trick and hopefully they won't itch anymore. So, all in all, I can only give 1 out of 5 stars.